Straw bale construction really can look this good! We are redefining the look of straw bale construction … with Strawtegic Concepts expertise in rendering and construction you will be asking yourself “wow – is that really straw bale?” See the latest photos of the Wandi House in our project gallery to see our straw bale construction masterpiece! (pictured right) Note: Wandi House designed by others. Expert straw bale construction by Strawtegic. Welcome to Strawtegic Concepts, professional straw bale builders and eco-building designers of Perth and country Western Australia. We will help you transform your ideas from imagination to reality. Natural building with straw bales is one of the most environmentally-friendly and sustainable building methods in the world and is rapidly gaining popularity for all the right reasons. Along with it’s many other good qualities straw bale homes look great, are very durable, provide great thermal and sound insulation, are affordable and practical for owner-builders, and also have a great feel or “energy” about them. We build and/or spray render straw bale walls for builders, architects, owner builders, in fact anybody who needs professionally-built straw bale walls. 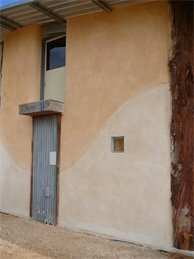 The key to professional-quality straw bale building is in the application of the render coats. We recommend and use our purpose-built spray render pump to ensure that the consistency and quality of the render is maintained throughout the build. The speed at which our spray render pump applies the surface finish is incredible. (as you can see in our YouTube video below) The final coat is then smoothed off to achieve your desired finishing effect. By using the spray render pump, not only can we give the walls a professional finish, but the amount of time required to build the walls is also dramatically reduced. Where traditional hand rendering would take weeks to complete, our expertise at spray rendering now reduces this time to a matter of days. We also run regular hands-on straw bale building workshops to teach everyone how to build straw bale walls like an expert. The best way to learn is by doing. During his workshops Dave will teach you everything you need to know about straw bale building from the ground up! See the Training pages for more information. Bring us your building plans from your own architect or designer, or let our own eco-designer work with you and your ideas to create something special. Our eco-designer is experienced in solar-passive and energy-efficient design and can provide you with a complete design & plans service for council approval. For the very best in straw bale spray rendering, construction, training and building design go no further than Strawtegic Concepts. We will exceed your expectations at every step of the way. Dave Morris is our master craftsman and his expertise will give your straw bale home the wow factor. Dave can help you at any stage of your building process. Please don’t hesitate to contact Dave to see how he can help you with your next straw bale building project. We can help you with top quality straw bale construction including spray rendering of your straw bales. 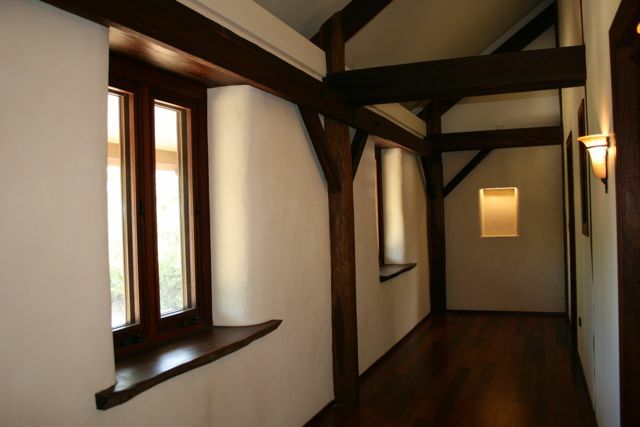 Spray rendering takes the hard work out of straw bale building, you can cover areas in days instead of weeks! We hold regular training workshops in country Western Australia and the Perth hills to teach everyone the tips and techniques of straw bale building like an expert. Our workshops are scheduled on demand, so contact us today to register your interest. If you don’t yet have your design or plans prepared our Environmental Designer can help with everything you need. We can provide plans at any stage from concept plans through to working drawings and engineering drawings for council approval. 23rd May 2013: Back by popular demand! Dave is scheduling more of his great straw bale building workshops for 2013. Subscribe to our newsletter to be notified as soon as dates are scheduled and enrolments are open. 1st June 2012: Returning from the ashes. Our June series of workshops will feature a special project, rebuilding a Perth Hills home destroyed by bushfire. Looking forward to some great weekends of building and learning! 21st January 2012: Another great photo shoot! See our latest photos of the Wandering workshop/apartment in the Project Gallery. 12th January 2012: The sensational Wandi house is now fully completed! See all the great photos from our recent photo shoot in the Project Gallery. 8th January 2012: The gorgeous Mundaring Cottage is now completed. New photos in the project gallery. See our video on YouTube - Dave demonstrating the use of his spray render pump at one of his recent straw bale building workshops.